Recognize their crowning achievement with champagne. Featuring an impressive Champagne selection and a delicious array of gourmet foods and sweets, this prestigious ensemble is ideal for celebrating the most special of occasions. 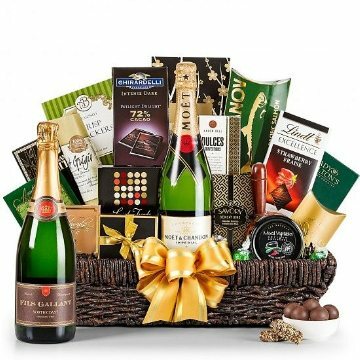 Your choice of Dom Perignon or Moet & Chandon Champagne will include: Auberge Camembert Cheese Spread 3.75 oz, Cheese Spreader, Salami con Vino 7 oz, Sweet Hot Stone Ground Mustard 3.25 oz, Aaron Bell Crackers 3 oz, Aaron Bell Pretzels 4 oz, Mini Chocolate Chip Cookies 4 oz, -Macadams' Raspberry Tea Cookies 3 oz, Aaron Bell Wasabi Peas 2 oz, Gourmet Seasoned Popcorn 1 oz, Spicy Snack Mix 2 oz, Dolcetto Peanut Butter Wafers 3 oz, Mango Jelly Beans 4 oz, Pineapple Jelly Beans 4 oz, Tropical Island Mix 2 oz, Nunes Farms Roasted Almonds with Sea Salt 3.5 oz, Vanilla Creme Nougat Caramels 2 oz, Auberge Camembert Cheese Spread 3.75 oz, Cheese Spreader, Salami con Vino 7 oz, Sweet Hot Stone Ground Mustard 3.25 oz, -Aaron Bell Crackers 3 oz, Aaron Bell Pretzels 4 oz, Mini Chocolate Chip Cookies 4 oz, Macadams' Raspberry Tea Cookies 3 oz, Aaron Bell Wasabi Peas 2 oz, Gourmet Seasoned Popcorn 1 oz, Spicy Snack Mix 2 oz, Dolcetto Peanut Butter Wafers 3 oz, Mango Jelly Beans 4 oz, Pineapple Jelly Beans 4 oz, Tropical Island Mix 2 oz, Nunes Farms Roasted Almonds with Sea Salt 3.5 oz, Vanilla Creme Nougat Caramels 2 oz. Dom Perignon: Is a classic Dom Perignon vintage that floats on the palate with remarkable grace. The presence of the wine on the palate is immediately captivating with fine bubbles and flavors of fresh almonds and preserved lemon. Paradoxically concentrated yet creamy, this perfumed, inviting vintage is elegance personified, and fully merits its reputation.